Biometrics involves the use of physiological and behavioral characteristics to provide the identification of individuals as applied to physical and network security within a business. A major aspect of information security is the ability to protect an information resource from both internal and external threats. The field of biometrics serves as the means of protecting both the physical building of a business and the IT tools that serve as its information resource. These IT tools include the computers housed within a building and the network by which these computers communicate information amongst users. All businesses around the world utilize information as a resource in its daily operational activities, protecting that information is the goal of biometric technologies. According to the National Institute of Standards and Technology, the field of biometrics is expanding to provide a variety of “highly secure identification and personal verification solutions ” that will improve information security for individuals, businesses, and governments world-wide. Biometrics uses preregistered physiological and/or behavioral data pertaining to individual users to verify or identify the individual. 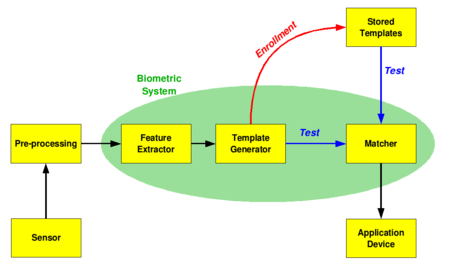 Identification biometrics identifies an individual user from a large enrollment database (Who am I? ), while verification biometrics confirms the identity of an individual by linking their name with the preregistered physiological or behavioral data on file (Am I who I say I am?). The division between physiological and behavioral recognition is an important aspect of biometric technologies. Physiological biometrics analyzes the physiological characteristics of an individual. By definition, physiology is “a branch of biology that deals with the functions and activities of life or of living matter (as organs, tissues, or cells) and of the physical and chemical phenomena involved" . This division of biometrics includes the following: fingerprints face recognition, iris recognition, hand and finger geometry, and DNA analysis. 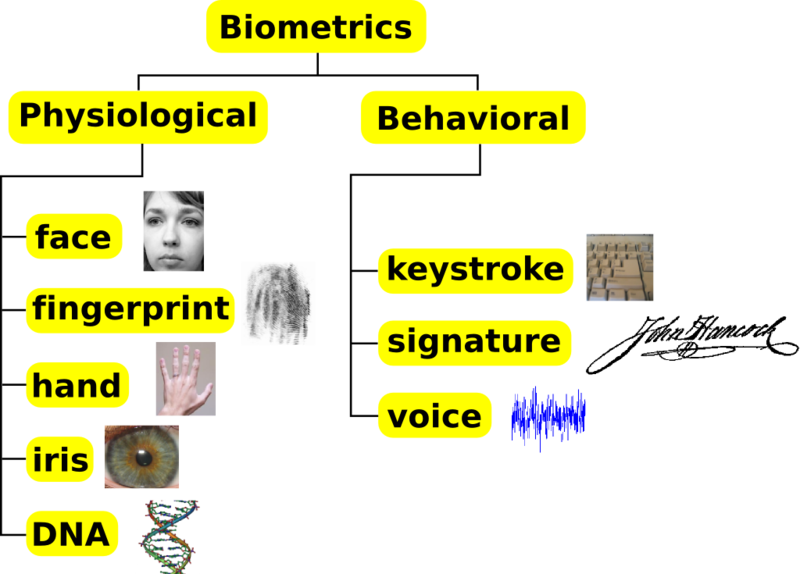 A second division of biometrics is behavioral. Behavioral biometrics deals with the identification or verification of individuals based on the manner in which they conduct themselves through various activities. 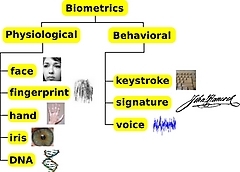 The behavioral division of biometrics includes the following: keystroke recognition, speaker (voice) recognition, and signature recognition. The most common biometric system application used today is AFIS, the automatic fingerprint identification systems, used in forensics for the identification of convicted criminals. Recent advancements in biometric sensors and matching algorithms have resulted in widespread employment of biometrics in numerous civilian and government establishments. Specific applications include terminal and network access, sign-on (log-on) restrictions, data protection, wireless and remote access limitations, transaction security, and Web security. 2. Haag, Stephen and Maeve Cummings. Information Systems Essentials. Second Edition. New York: McGraw Hill/Irwin, 2008.